I'm on a roll, as here comes yet again an update! This week we achieved a start of a rotisserie (for the frame work), installed an exhaust fan and shop computer, made a holster for the welding gun and generally "dicked" around in the garage. 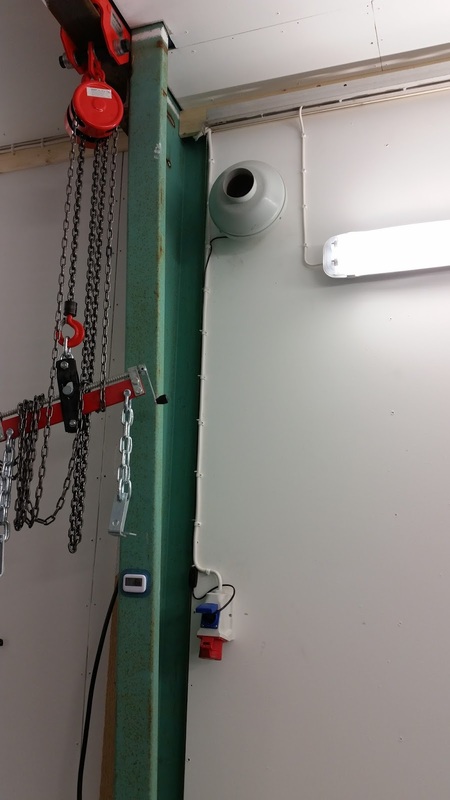 After the first welds in the garage, it was obvious that an exhaust fan would be needed. So we drilled a 100 mm hole in the wall, stuck a pipe through it and mounted a fan to it. Might have to add some ducting to it as to gather the fumes more efficiently. Time has slipped away and project has not moved forward very much. Time has went to real work and preparing a warm garage for the winter. 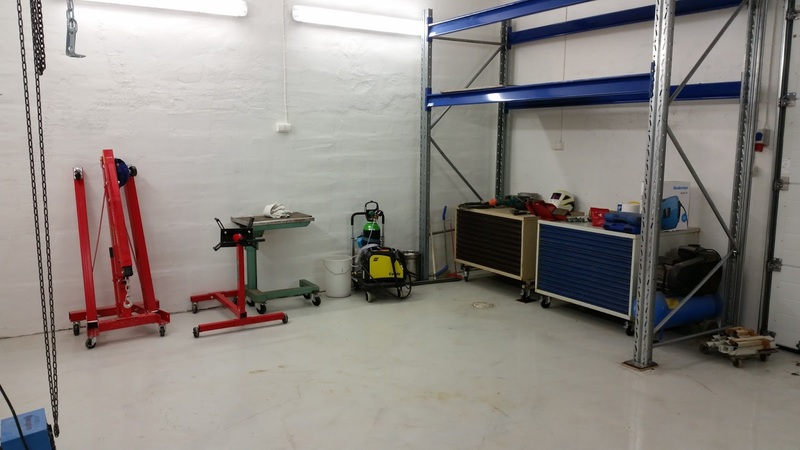 This garage is Mark II, because if the reader remembers, this was the first idea for a warm workroom. Well that fell through, because it would not have been very practical. Luckily my father saw my predicament and suggested that we might build a warm room to our machine hall. The room is the same where the journey of Zeta started 364 days ago, but now one can say that the room has improved a lot and it can't be recognized as the same. Floor is coated with epoxy and saturated with quarts sand for added toughness. Not a lot has happened since last update. 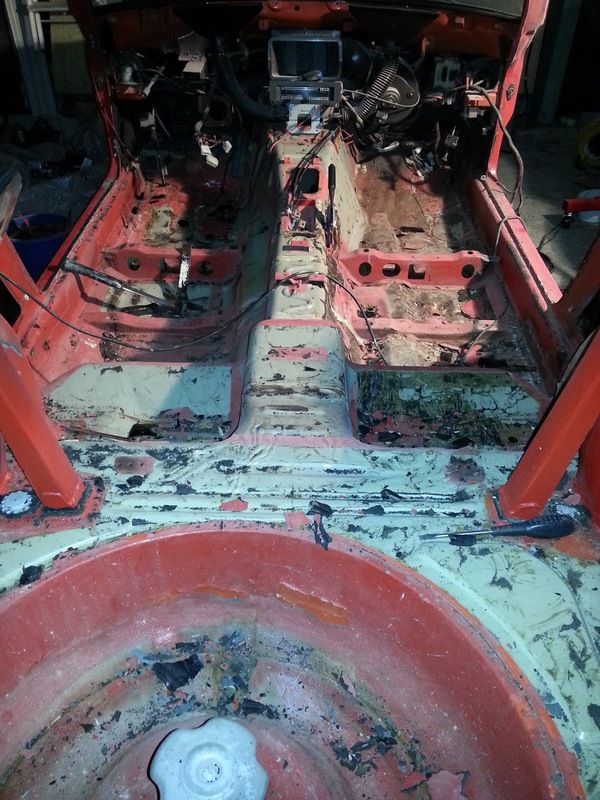 Zeta has been lifted to the rotisserie and I have been looking the carnage of previous "fixes". The chap that has been welding Zeta before was certainly a bit of a poor welder... I'm hoping I can better him. Frame rails are unfortunately shot... these I'm going to change to a steel profile and extend them to the whole cars length. Also I'm going to change the seat rails to steel profile and add one more "cross member" to both sides of the car. Should stiffen the car nicely. 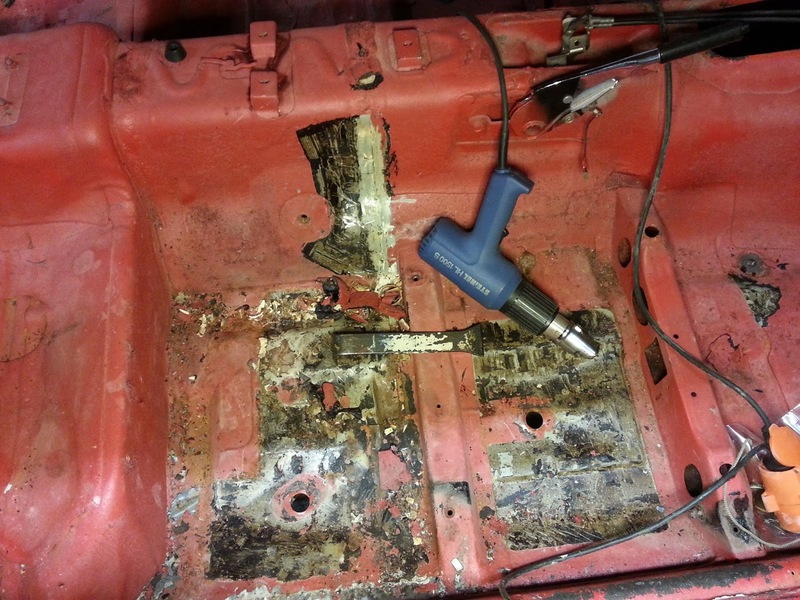 Also the floor pans are going and I will replace them with suitable pieces of sheet metal or ready made pans if they can be found. More likely will be the sheet metal option. And now a "picture dump" about the blasting outcome. The car was blasted with soda and glass and took 21 hours. Almost half of this time was spent by working with the underside, because the rust proofing was so tough and did not budge easily. Doors and tail lid took 3 hours each so it took its time! Well packaged because of the looming rain and wet road surface. The tarp did not let any water through. I might say that I was very pleased. A lot of water has flowed under the bridge since last update, but fear not; project has not been abandoned. Since last time Zeta has been moved to a different location with a very simple "trolley". 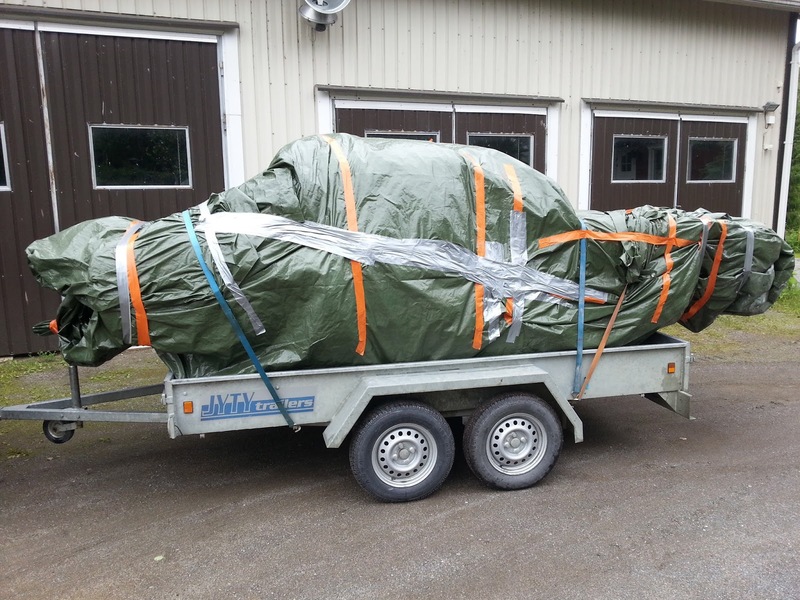 The trolley consist of one pallet and pallet sheet that has been outfitted with wheels. I think everyone is already sick n tired about these dismantling updates so I keep this one short. First take all screws off that keep the glass attached to the window lifter or what it is called and the window frame, after that take the glass off. Then take the window guides and window lifter off and lastly the handles and locking mechanisms. 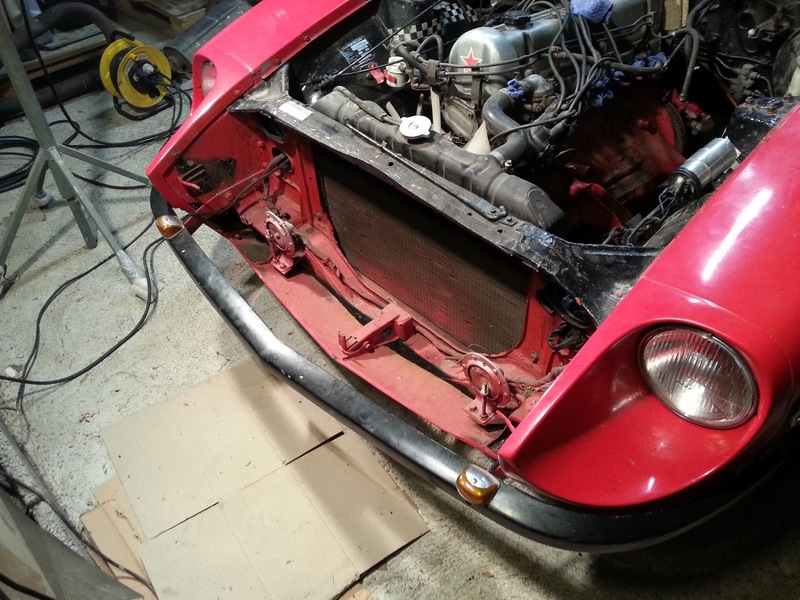 During the weekend I took apart the front and rear suspensions, took of the boot lid, cleaned up the engine compartment and took of all remaining fuel and brake lines. By removing all the brake and fuel lines as a whole system I got a model to follow when making new lines. I'm going to do the lines from pipe and making sure that they withstand ethanol. Did not have a "rear axle stand" or "sliding hammer" so I just placed the rear suspension so that the rear axle could move freely. Then I threaded one of the lock nuts on it and placed wood block on top of this assembly. Then I whacked solid blows to the wood block and the rear axle came out unharmed. 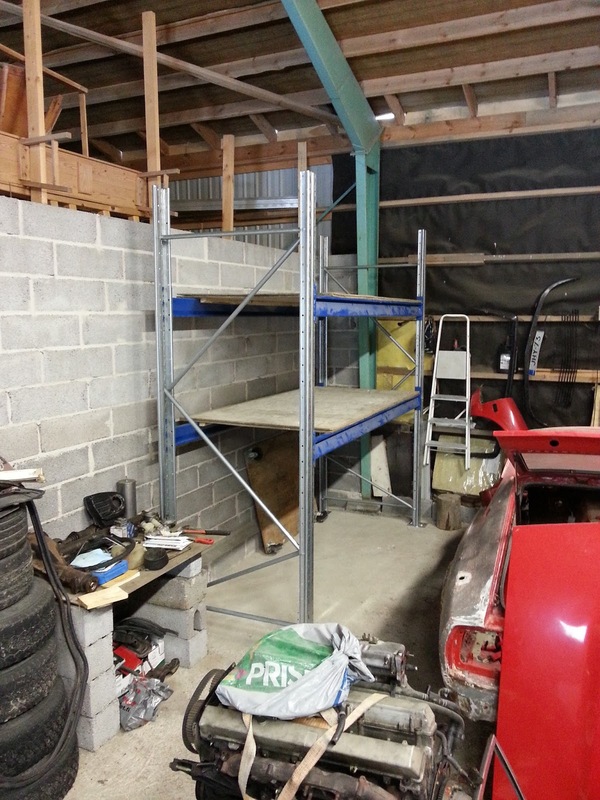 Sunday was a bit shorter day with the car, because we fixed our pier. Few telephone poles were driven to the lake bed and they lifted the pier nicely. Well back to the car. I started with the rear brakes. The brake drums were on very tight but few taps (well a lot of them) or better yet blows later and the other brake drum was open. 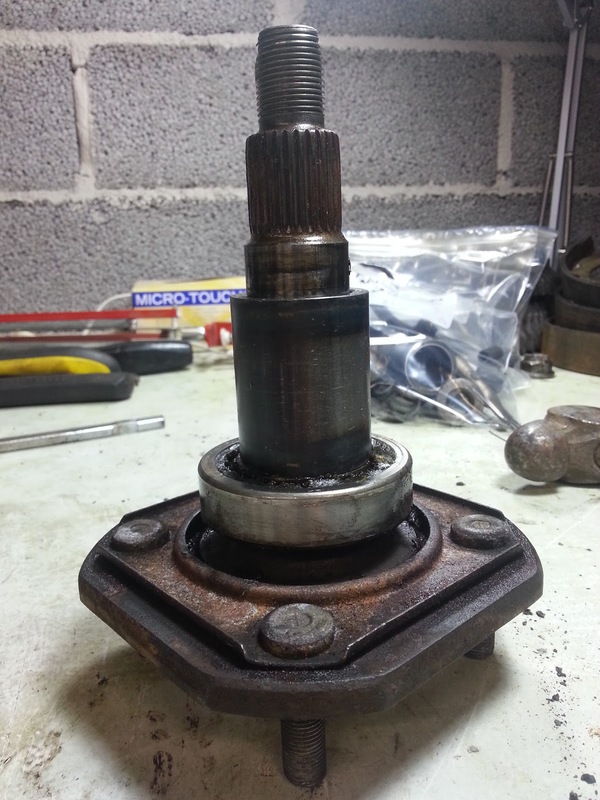 After the brake drum was dismantled, we opened up the hubs locking nut. "Some" force was required to get the nut open. We had to use a socket wrench and pipe wrench that were over a meter long. Very effective locking nut! Here's some pictures about that carnage. Now follows a mid weekend update. 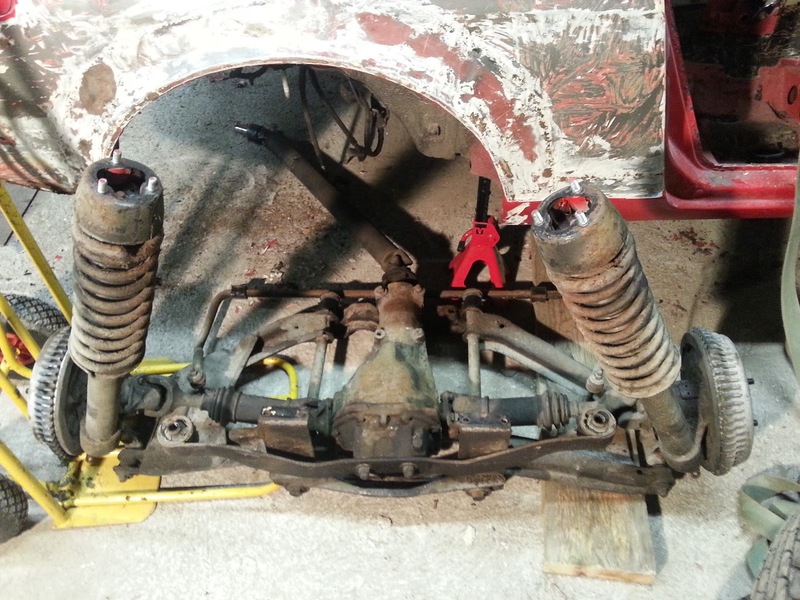 I have been dismantling the front suspension pieces to "atoms" and also the old motor got moved to a pallet so I could free the motor stand for the new motor. 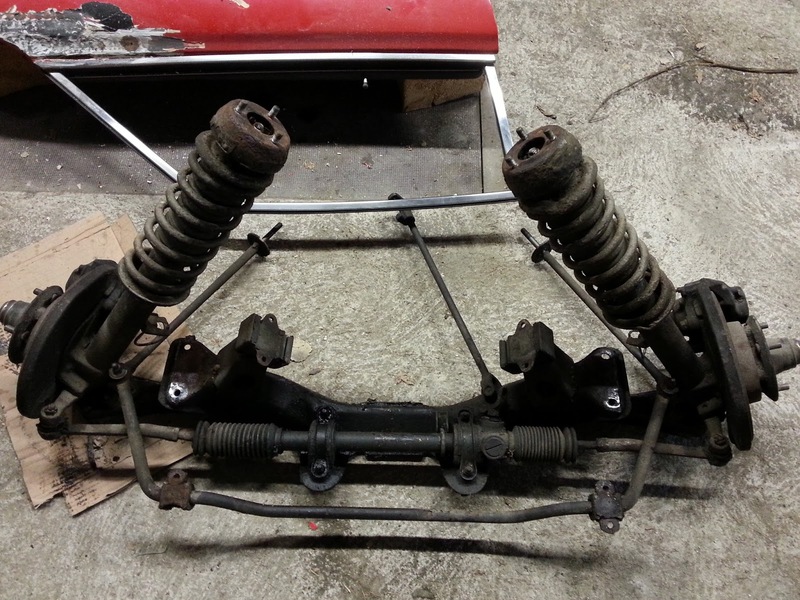 The front suspension is covered in rust proofing and oil so it's a very messy job to dismantle it. Bolts have been coming off pretty nice but the bolts that keep the brake shield in place very so rusted that I had to cut them... Now I must drill them out. Nice! Quick update about last weekend and sadly Zeta is still not ready to be blasted. Weekend was a bit busy one and I got to work with Zeta only on Sunday so progress was a bit limited. My father had bought pallet shelves and the day started by installing those. Now we (or I) have plenty of room for engine parts and misc. parts. During this project the shelves are filled with Zetas parts. They sure give plenty of extra room! I'm hoping that this would be the second to last update that deals with taking the car apart and on the following updates I can concentrate on other things... hopefully more interesting things. 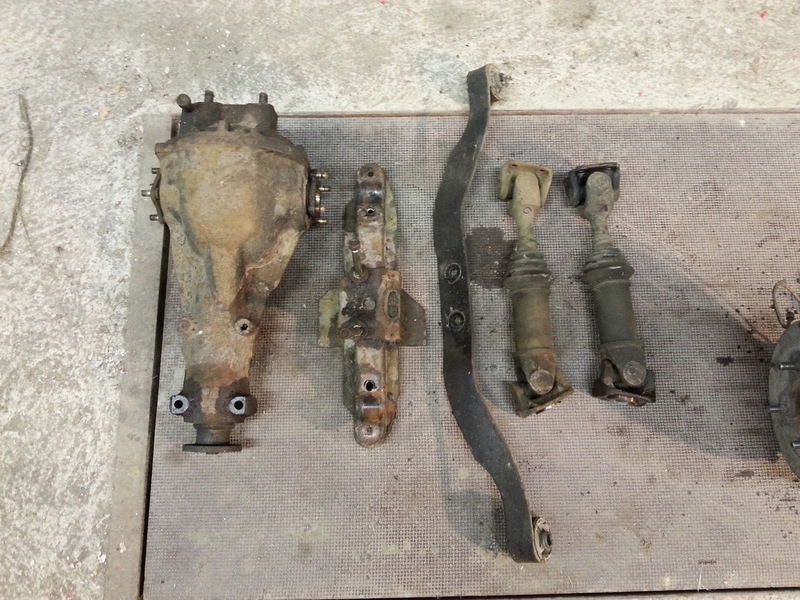 During the weekend I got the front and rear suspension assemblies dismantled and the parts washed. Also I test fitted the Patrol brake master cylinder... Did not fit :D This was because the bolts were few millimetres off. The old saying that "measure twice (or in my case thrice) and cut once" still rings true. The fix for this problem should be easy, just drill or elongate the mounting holes of the brake master cylinder by few millimetres and it should fit. Also the aluminium plate, that the OEM solution has on the master vacuum, needs to go but fortunately it is held on by two nuts and easily removed. Regarding the dismantling of rear suspension, my god they used soft bolts and nuts when putting Zeta together. The bolts were a bit stuck on the left hand drive shaft and when trying to open them 50% of them got rounded. I soaked the bolts with WD-40 before trying to open them but no luck. On the other hand bolts on the right side drive shaft were finger tight. Might have been a nice surprise if I had not gone through the car and just started to drive it. With the front suspension the same trend continued. Not cutting bolts but stuck parts. The steering rack ends were on so tight that I could not get them to separate from rest of the assembly... In other words work continues with it! So few cut bolts and few choice words later, I had loads of parts to clean and more bolts to change when putting the car back together. Not a problem because all bolts will be changed for better ones. We continued Zetas deassembly during the previous weekend and I can now say that taking Zeta to media blasting has never been this close. Almost all parts that can be taken off has been taken off, but few small items still remain attached to the body. 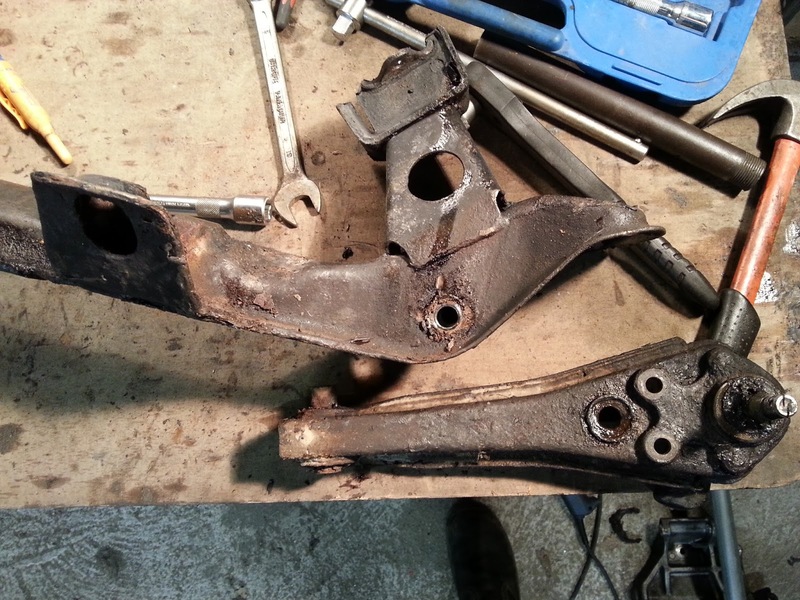 I took off the rear suspension assembly as a whole unit and it came out very easily. Again only few bolts had to be cut but nothing major. If someone else likes to take the rear suspension and drive gear out as I did, be prepared to lift the car at least 50 cm. This is needed because the strut tubes don't turn to the sides very much and because of this the assembly is stuck in the wheel wells. Fortunately we have a JCB (same one that was used as "engine crane") so we could lift the whole car very easily and then move the rear suspension out from under the car. Progress with Zeta has been a bit slow during the last few weeks. Have been staying in Helsinki, so time with Zeta has been a bit limited. Regardless of that, I have made few purchases for the project. 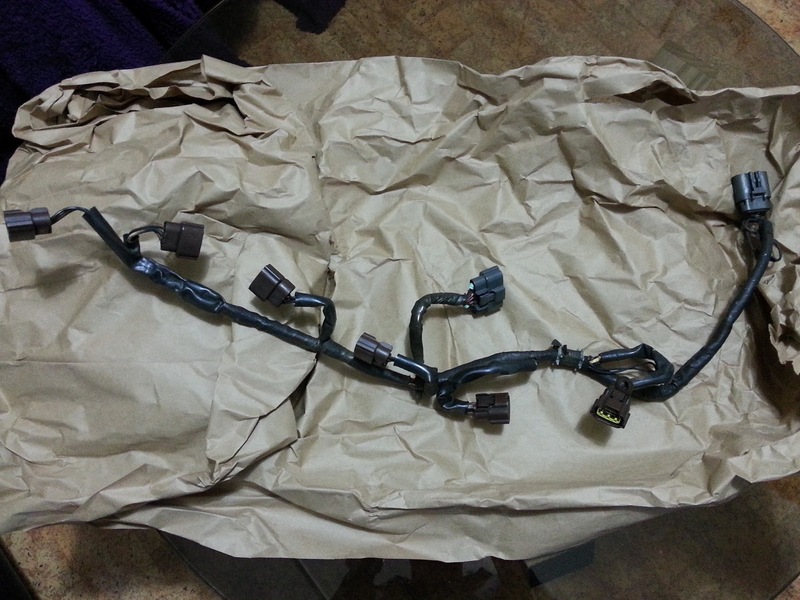 The most important purchase was a coil harness from RB26, because our engine did not come with one. It is in good condition as far as I can see, but prior to the LS2 mod (My previous post), I will be going through the harness with a multimeter and check every wire for continuity. Better to be safe than sorry! As one can deduce from the headline, I have bought an engine swap for Zeta. My choice was a RB20DET because of its stock values. With the RB20DET all of the requirements that Finnish law has to "offer" to register Zeta will be met. 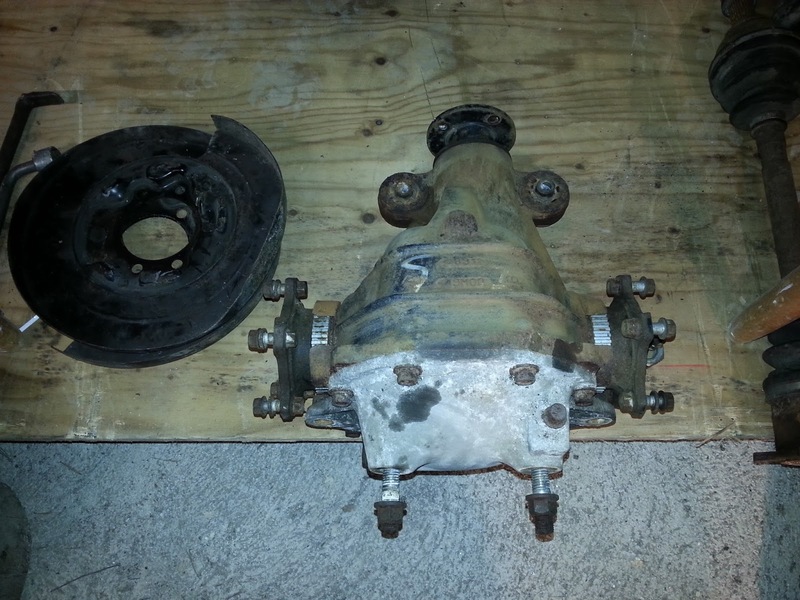 The swap came with motor, almost all of the auxiliary parts and gearbox. Turbo was not a part of the deal, but that would have been upgraded anyhow! What did came with the kit was stainless exhaust flange to make new exhaust manifold and a stainless surge tank. Seller was a real pleasure to work with because as soon as we showed up to look at the motor, he offered to open it up so we could see that it is okay and so we could see what we are buying. Also the price was more than reasonable... with the price difference to other engine swaps, we can machine the engine and rebuild it and still have money left for a new turbo. Also ceramic coating would be nice in the engine (Martelius - Keraamiset pinnoitteet). We are also upgrading the bolts, nuts and seals and gaskets of the engine so that it will be like brand new! Just a small update before a a bit bigger one. Weekend is over and the front suspension assembly is detached from Zeta. One bolt on the front stabilizer bar had to be cut of but all other bolts opened up nicely. Also I had to cut the "lowest" brake lines on either side because the flanges did not want to budge... No big deal, because I planned to replace all of the hard lines anyway. 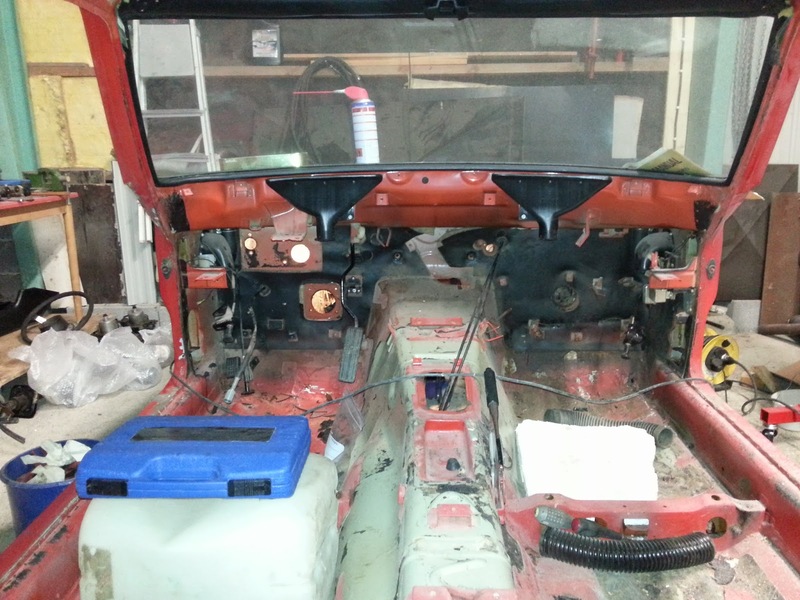 Below one can see the whole front suspension assembly and part of the right door. 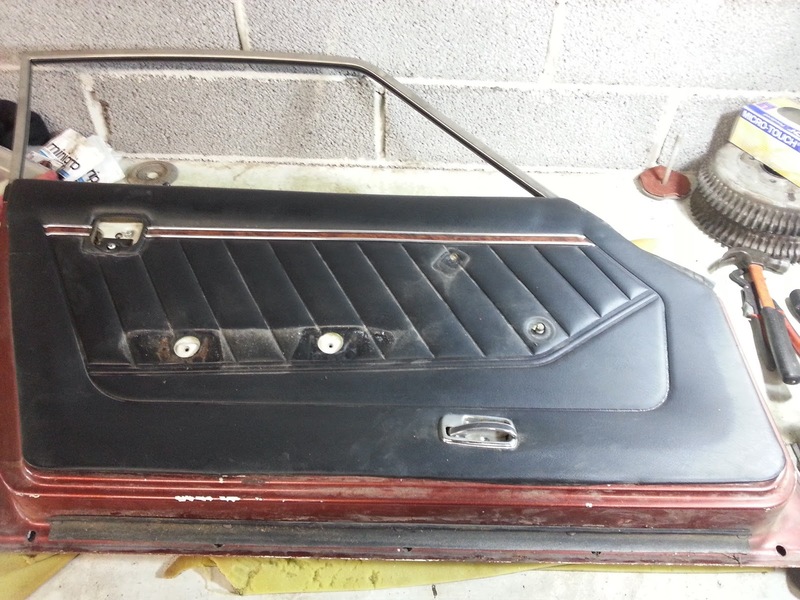 Work continued also with the rear fenders and as a new project with the right door. 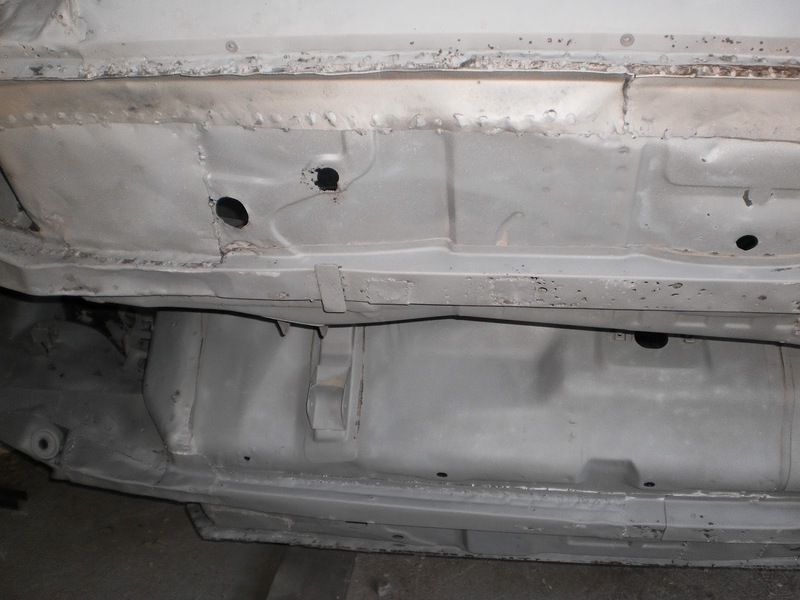 From this I don't have any pictures because no-one likes to see yet another picture with rust and body filler! 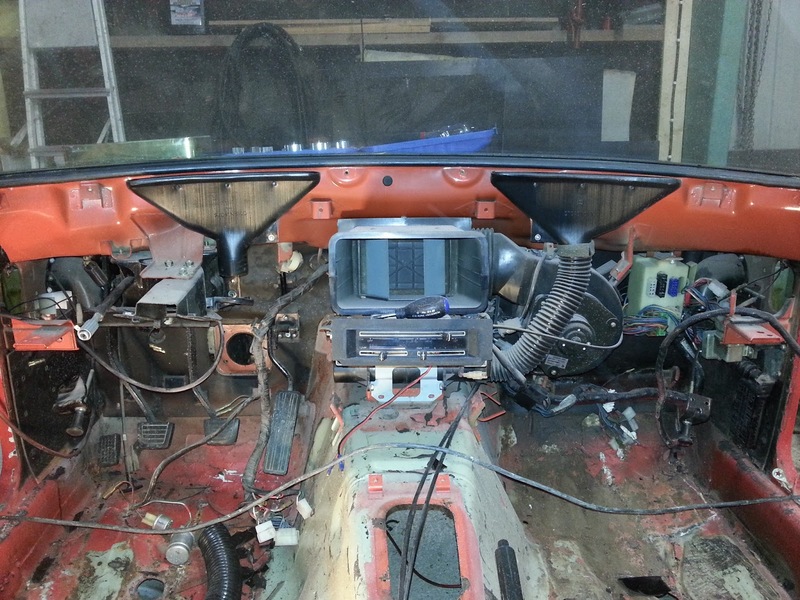 During the weekend I removed the "aircon" from the Zeta, pedal box and the full wiring harness. As I read more information of this differential "swap" I noticed a very critical error in my plan, Zeta already had the mentioned differential aka R200. The only difference was that Zeta has the "long nose" -version and no LSD. As Zeta has this part as an OEM part, swapping to this differential does not give any real advantage and so it went back to my friend as went the rest of the parts that came from his Z32. I highly urge anyone that is interested in changing their differential, to read this thread in Hybridz: Differentials 101. It will make everything much easier. I'm planning to add a Limited Slip -lock to my differential with an OBX unit. 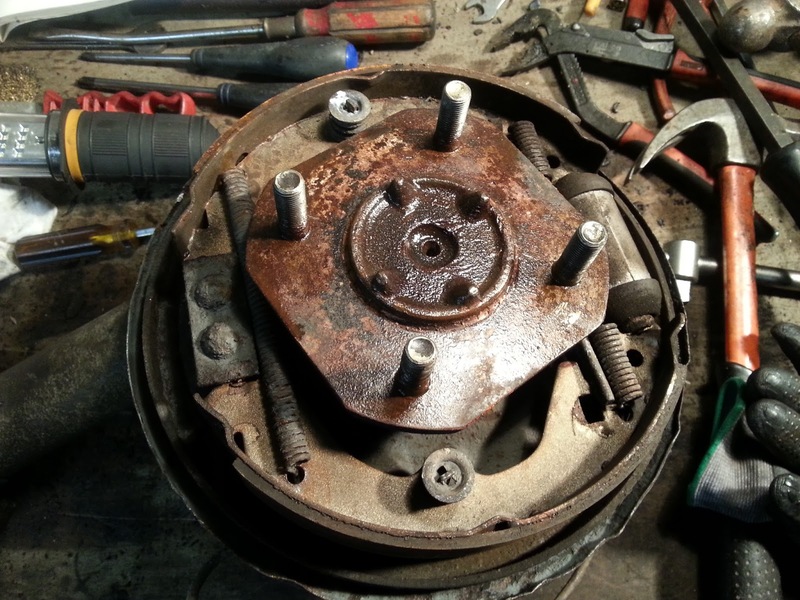 One can read all about it in these threads/links: OBX Differential Inspection and Installation, How to Rebuild your OBX Differential and OBX vs Quaife (with pixors). This unit is made for the Nissan 300zx and 240sx and it should be a direct swap. Just got to make sure that the unit is meant for the non-lsd version of the 300zx or 240sx, because factory lock is not interchangeable with the normal differential. At least according to the Hybridz forums! There also has been some problems with OBX units but with proper installation and tuning it should be "just what the doctor ordered"! The work continued with the soundproofing mat. Fortunately the weather got colder and as the thermometer showed -20 centigrade, I began to chisel the mat away. This clearly was the better way compared to heating the mat, because when the mat is cold, it just lifts off and brakes to pieces like glass when hammered with a paint scraper and hammer. This time I'm concentrating to the sound proofing mats. I'm taking the mat off because there is a lot of it and when sand-/glassblasting, it could be a problem (and drive the price up). My modus operandi is that I heat the mat with a heat gun and then scrape the mat off with a metal scraper. Slow and tedious work, but my time is free compared to the blasters time. Another way would be freezing the mat, but unfortunately the weather is a bit warm for that and I'm not going to buy dry ice, if heat gun does the trick. 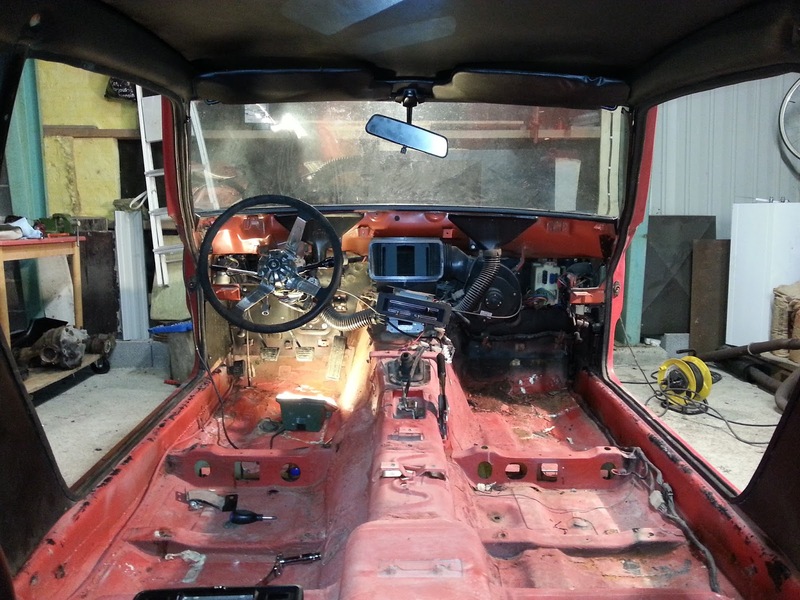 As I mentioned in the previous part, next up was the interior. One can see some of the rust problems I'm facing in the interior in the foot wells. Because of the sound proofing mat, water has been sitting between it and the sheet metal, so rust has been taking its toll. I got a good deal for Z32 differential (with LSD) and drive shafts from a friend and I could not let that one pass. I'm aware that those parts are not a straight swap but it should be interesting to mate those parts to Zeta. Probably (definitely) going to need parts cut with CNC and drive shafts shortened, but at least the differential should hold to the end of time with the power goals I'm having right now. A lot of different things has been going on with the Zeta. 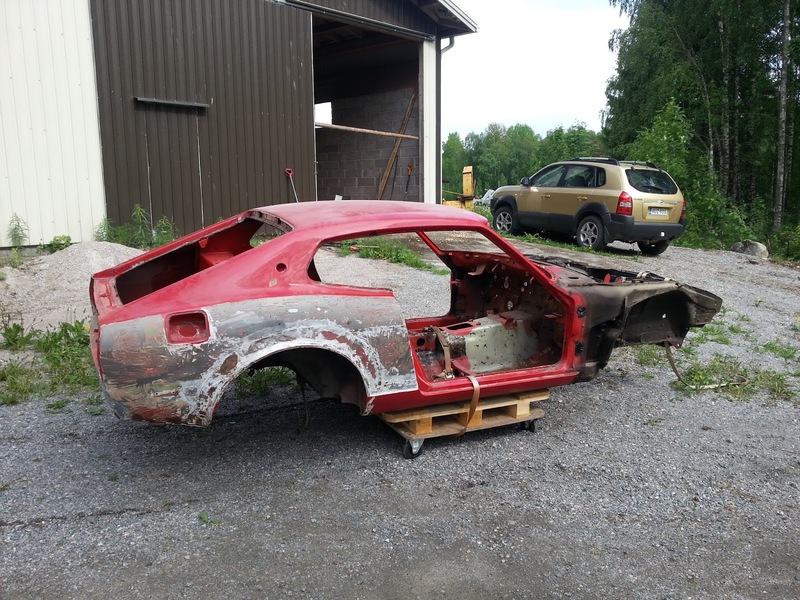 Well technically not "a lot different things", but a lot of stripping of the car to the bare metal. The de-assembly started by taking off the hood, front bumper, lights, light buckets and fenders along with the front air dam. Almost all bolts opened up just fine and only few bolts caused trouble. The bolts of the left fender and one of the bolts that keep the light buckets attached, had to be cut off.